This may be the last short sleeve shirt that leaves my studio this summer! 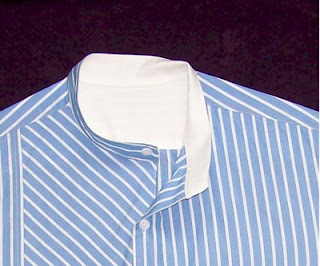 made from lusciously smooth Swiss Cotton. Front Bias Inset, and an Angle-Edge Pocket. Sewing Notes: Imported Fabric, Interfaced with Pro-Tricot from Fashion Sewing Supply, Buttons from Fashion Sewing Supply. That is stunning! As always, wonderful job! Beautiful just as all your previous made shirts. Wonderful shirt and design, Pam. Your work is always so amazing. Another great shirt! Your sewing is incredible. What a great design Pam. I clicked the second photo and wow, really love that collar and your edge-stitching is awesome. Great design! Again you have come with something awesome. The way you have stitched the edges has made me adore you. Looking forwward for more designs. 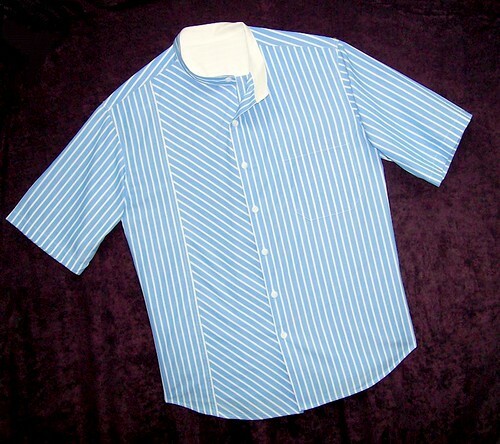 My husband has been begging for me to make him a "collar-less" shirt! He is a teacher and always wears a dress shirt. I believe I could do this but need a pattern. Do you sell your patterns?